Every morning I get up, get Spork up, move the cows, move the waterer, move the mineral feeder, get the chicken feed, take the feeder from the chicken tractor, move the chicken tractor, refill the feeder, put the chicken food back in the barn, collect the eggs, and then go back home to get ready for my day. I leave my beautiful wife and wonderful kids behind where they spend a good part of the day homeschooling. A few days ago the kids had taken a bunch of chairs and bar stools and blankets and had made a fort. It was a nice fort, quality construction. They were so excited and asked me to come inside for a tour. I looked at the cramped space and 3 foot tall ceiling and politely declined and let them show me around from outside. A few days later after my morning ritual with the farm critters, I witnessed what you see pictured on my way out of the house. 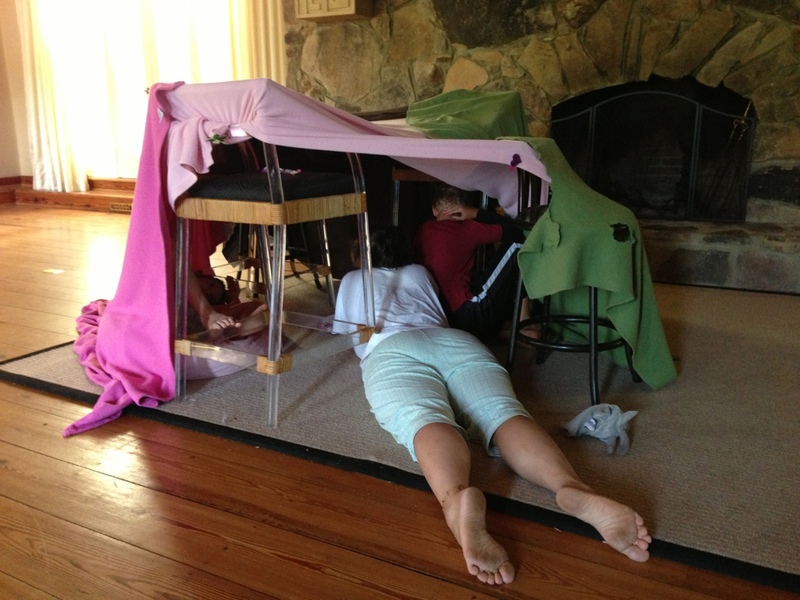 School teacher SWMBO was on her belly, reading them their history lesson in their fort. Everyone was still in their PJs and the kids were having a large time. That’s the coolest day of school I’ve ever seen. Made me want to stay home and repeat 3rd grade.